SBC CHEVY ALUM. PULLEY SINGLE GROOVE UPPER SWP # 9478 CLEARANCE! Single groove, fits sbc short water pump. THIS PULLEY HAS A TRUE ALUMINUM FINISH. 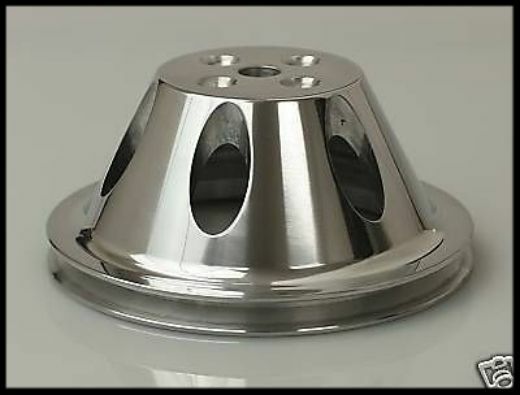 We also have the aluminum nose cones available. This pulley is for use on short water pumps used on SBC Chevy engines from 55-68-up. We offer many different style pulleys in our other listings. Aluminum water pump pulleys can be run with steel crank pulleys without a problem. Matching up both pulleys is most ideal. We have a full line of upper and lower pulleys. Please see our other listings. THE PULLEY HAS A RETAIL FOR $69.95 OUR PRICE IS MUCH LESS. Please leave your phone number in an email when using the "contact seller" tab. We never solicit our customers, but having your phone number in case of a shipping or service related problem is valuable.